Thugs of Hindostan collection Day 6: The Aamir Khan and Amitabh Bachchan film has earned Rs 129 crore so far. Thugs Of Hindostan Box Office Collection Report: Thugs Of Hindostan earned ₹ 4.50 Cr on its 6th day. Moviegoers are extremely ruthless and in no mood to splurge on movies they hear is substandard. In this era of social media, the word of mouth spreads faster than fire and can make or break a movie within hours. The same thing happens with Thugs Of Hindustan. TOH completly vanishes at the box office. – Thugs Of Hindostan is the highest opening collection movie for Bollywood [All Time]. – Thugs Of Hindostan is the highest single-day collection movie for Bollywood [All Time]. – Thugs Of Hindostan is the 6th highest India net collection movie for Bollywood in 2018. – Thugs Of Hindostan is the 2nd highest first-weekend collection movie for Bollywood in 2018. 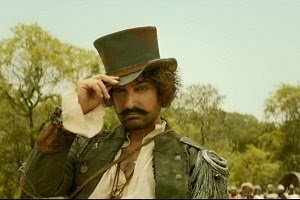 – Thugs Of Hindostan is the 5th highest first-weekend collection movie for Bollywood [All Time]. Previous articleAfter Magical Dilbar & Kamariya, Nora Fatehi Now Spreads Her Charm Down South! Next articleBhabiji Ghar Par Hain Actress Saumya Tandon Announces Her Pregnancy With An Adorable Post!